Has Anybody Else Been Confused By This Die Hard Plot Hole For The Past 29 Years? Die Hard co-writer Steven De Souza recently helped clear up a plot hole that I never quite understood (but always pretended to) in the original Die Hard movie. The plot hole I am referring to happened when Hans Gruber (the late Alan Rickman) first meets John McClane (Bruce Willis) and pretends to be a hostage that ran off. McClane immediately suspects something is fishy but it is not explained what tipped him off. So when McClane sees Gruber’s watch, being the sly detective that he is, he knew something was up. However, De Souza says the entire watch build up was taken out because it would have exposed an even bigger plot hole in the script. The terrorists, or “exceptional thieves” as Gruber put it, had planned on escaping in an ambulance they stashed in the parking garage. The problem was that the ambulance was not around when the terrorists arrived and sync’d watches. So basically the plot hole is there to cover up a larger plot hole. I think the stashed ambulance could have easily been explained away with some dubbed dialogue or a quick, inexpensive reshoot or two, but who knows. Nobody expected it to be the hit that it was, especially after Schwarzenegger backed out, so maybe budget for reshoots was simply not an option. 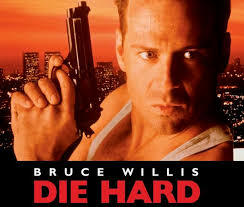 Either way, nearly 30 years later, Die Hard remains one of the top action, and to some Christmas, movies of all time. Sidenote: Speaking of Christmas, check out the Die Hard: Nakatomi Plaza Blu Ray Edition below. Makes a nice Christmas gift…for me…anyone? Previous Star Trek: Discovery Beams Up It’s New Captain!